MSC Virtuosa‘s namesake comes from the word virtuoso, meaning someone highly skilled in music. Each deck will, in fact, be named after a different musical instrument.This new cruise ship will be one of the two largest in MSC Cruises’ fleet, along with her sister ship MSC Grandiosa. One of the highlights of MSC Virtuosa‘s onboard entertainment will be the two brand new Cirque du Soleil at Sea shows, created exclusively for MSC Cruises’ guests. MSC Virtuosa gives guests the best experience with its expanding digital offer, spearheaded by MSC for Me and our digital cruise assistant, Zoe. 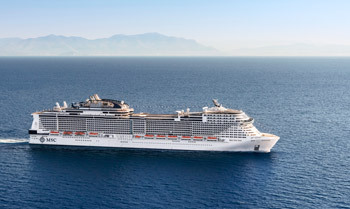 View all MSC Virtuosa cruises, view a selection of MSC cruise deals, or view more options for MSC cruises. Enjoy exclusive world-class shows performed in innovative venues like the Carousel Lounge and the multi-purpose karaoke bar, comedy club, TV studio & Bar. Younger guests can take advantage of the super-amusement park and sports centre to play sports and games during the daytime and party and dance in the evening. And the whole family can enjoy hours of fun in one of the most intricate and exciting water parks at sea. Twice every night, six nights a week, guests on MSC Virtuosa have the unique opportunity to see two original shows by Cirque du Soleil, the world leader in live artistic entertainment, and savor a superb culinary experience in the same glamorous venue. The Carousel Lounge is a technology-packed, entertainment and dining venue designed especially to meet the needs of Cirque du Soleil. This custom-built lounge can accommodate up to 450 guests, including more than 100 enjoying the full show-and-dining experience. One of the most intricate and exciting water parks at sea, with three twisting slides, a ‘Himalayan Bridge’ and a range of pools, features and activities for all ages. The large and spacious amusement park provides a large arena where young guests can play sports and games during the daytime… then socialise, party and dance the evenings away. MSC Virtuosa offers two teenagers’ clubs, one for 12-14 year olds and another for 15-17 year olds. In addition, a teens-only area serves as cinema, gaming room and disco, depending on the time of day, ensuring teenagers are always entertained. This central promenade is filled with boutiques, restaurants and tranquil spots for shopping, eating and relaxing… as well as socialising. And in the evening, it comes alive with music, parties and entertainment. With about 10 sq. m. of public space per guest, poolside space on MSC Virtuosa is some of the most plentiful to be found at sea.Beautiful lighting, a giant screen and atmospheric design make the main pool area even more alluring after the sunset. An exclusive haven of refinement.Discover a ship within a ship. A place where you can savour exclusivity and privacy in a world of choice. Where you can indulge in the luxury of a private club, while enjoying access to the myriad recreation and entertainment possibilities that the rest of the ship affords. The MSC Aurea Spa on MSC Virtuosa is a luxurious Balinese spa offering signature relaxation treatments to revitalize body and soul. Complete with a thermal area, beauty salon and nail boutique, the MSC Aurea Spa will leave you feeling pampered from head to toe. Equipped with state-of-the-art Technogym cardio and strength-training equipment, the MSC Virtuosa gym offers a wide range of innovative fitness courses and training programs.